Every day, coolest parent ever Nina Levy draws pop-culture characters on napkins, which go in her two son’s lunch boxes and are returned home. At first, the simple doodles were actually used as napkins, but with Levy’s increasingly complex drawings and her sons increasing age, they’re now carefully brought home, boxed, and shared via Levy’s Daily Napkins blog. Levy writes that, “Neither child uses them for anything besides decoration. Several years ago my older son told me helpfully, ‘Oh, I only use the napkin to get attention. I just wipe my hands on my clothes.’” Good thing, because these napkins are too cool to throw away. 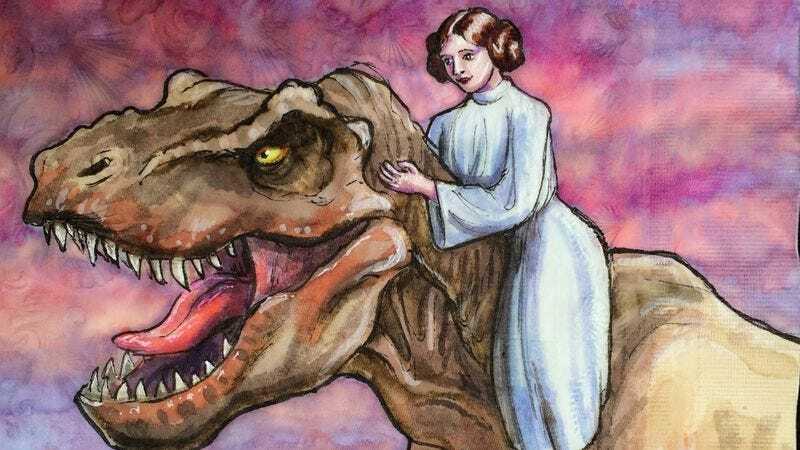 The Star Wars characters on dinos are just the latest series in Levy’s collection; she draws whatever her sons are interested in at the moment. Her blog has the napkins organized by subject: For instance, there are 12 Ewok napkins, 13 Captain America napkins, and 23 Godzilla napkins. Tags sorting drawings by concept reveal some of the most interesting and creative napkins, like Small Furry Things With Weapons and Giant Video Game Characters. Others, like Battlepug and The Secret Life Of Fluffy The First Grade Hamster, put non-pop-culture creatures into pop-culture scenarios. Even the napkins sorted under mundane categories like “broccoli” are incredible. Levy incorporates the vegetable into drawings depicting Groot, Rocket Raccoon and Chewbacca, and Iron Man.